The team really pulled together and polished off all the details over the last couple weeks. 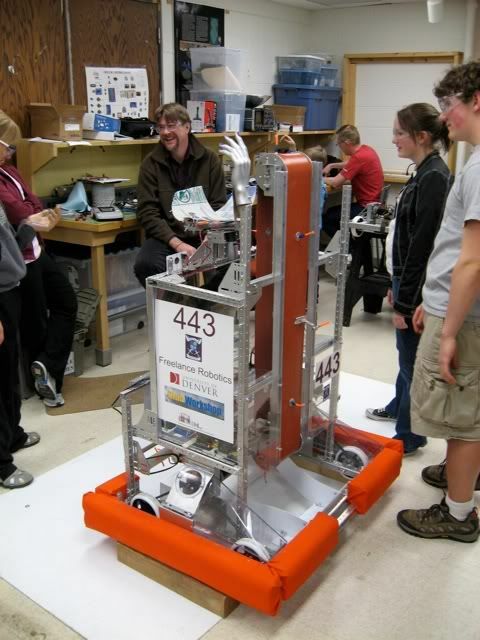 Bumpers were built after 3 tries at fabrics, lexan covers made to protect people from pinch points and protect the bot from debris and collision, vinyl stickers declaring team and sponsors, and numerous finishing touches. The scrimmage on Saturday was a success (so I hear; I was out of town) with the robot able to score on other trailers very consistently. The robot weighs in at around 100# last I checked, but they added balast towards the rear to improve handling and traction last night before packing it up to ship out today. Yup, that's right, the robot is crated and ready to go! Let me tell you a little about the robot (I am including this from a prior post as this content is more appropriate here, plus I now have pictures to go with the descriptions). 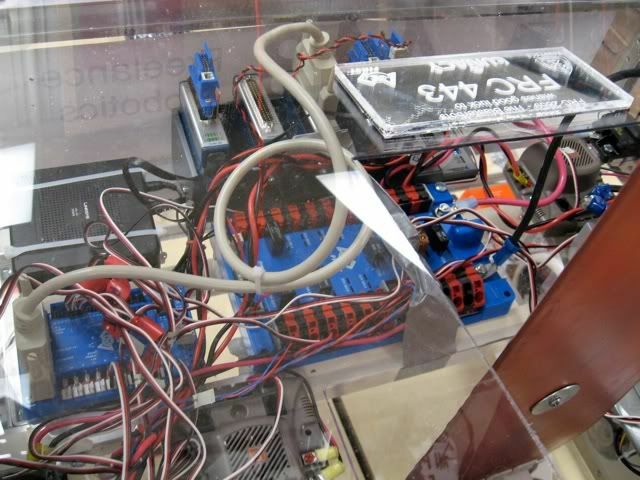 The robot has seven separate motors to drive all the wheels and gizmos on the robot. We've used up our entire stock of aluminum channel from the FIRST kit as well as a healthy portion of additional channel we bought. We're running 4 wheel drive skid steer, with one CIM per side driving the wheels with a single chain. We're using an industrial belt mechanism (above right) with a longer belt adapted to it, and one of the smaller FIRST DC motors driving it via the original chain/sprocket system. 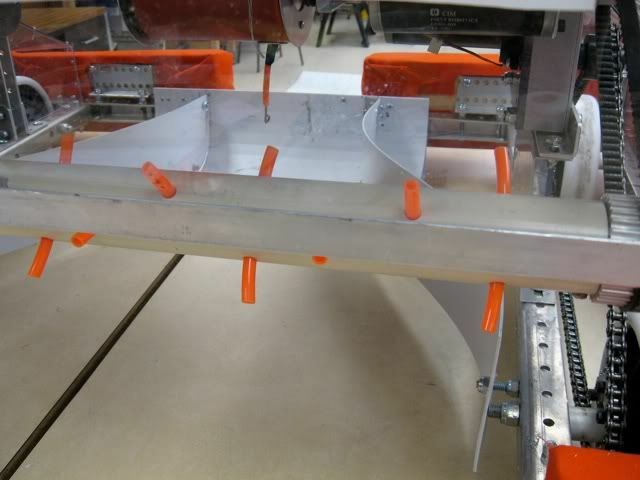 We've added hooks to the belt to lift the balls out of the back of the chassis area and up to the scoring device. 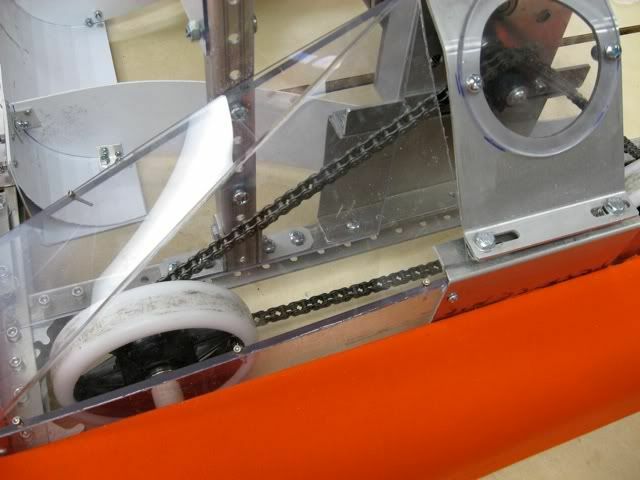 There's a rolling bar on the front of the chassis (above left), just below the height of the balls to help force them into the chassis--or spit them out if need be. It's driven by a CIM and belt drive at a fairly high RPM. The controller (above right) sits on top of the raised platform just above the ball collection area. The ball lifter (orange belt) rises up just behind that. 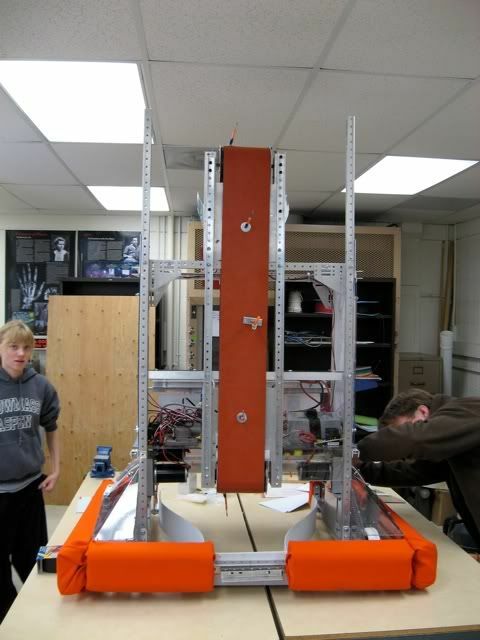 We have two more motors on the chute that guides balls to their target. They have wheels attached to accelerate the balls along their path. In all, this robot build-up has been a big, satisfying success! 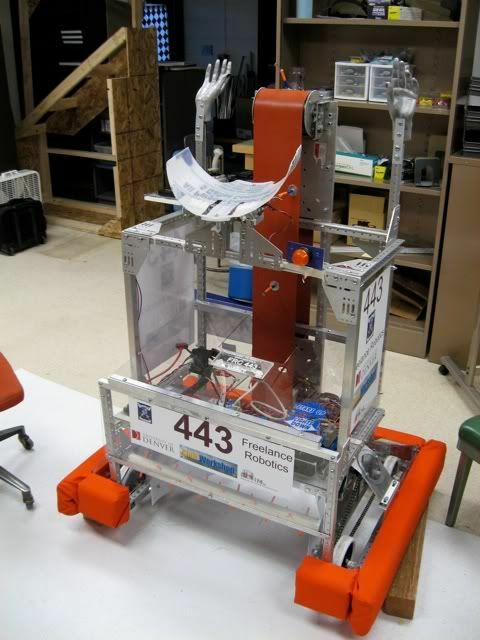 From idea to tentative designs and builds to raw panic to finished and very functional robot all in two months. What a ride! And we're not done yet, we still have the Regional Competition on March 26-28 at Denver University Magness Arena (pdf). Hope you can make it!